14 posts categorized "Monopoly and The Landlord's Game "
One of my standing google alerts took me to an editorial in a northern California newspaper endorsing the call for a 1/8 cent sales tax on all goods sold within the county to support the town's library, which, because of Proposition 13, receives no funding from the county. They have exhausted their ability to do fundraisers, have no acquisition budget, and if the library goes from its current 3 or 4 days a week to none, the existing collection will be divided up and people will have to drive to one of the other 2 libraries in the county. Amenities like libraries and good schools and well-maintained streets, among many others, are what make a community a good place to live. They support and increase land values; they don't change the value of the structures that sit on that land. The sensible way to finance them is through taxes proportionate to land value. Those who own a large, well-located lot pay the most; those who own a small share of a large, well-located lot pay their share of that lot's value; those who own a small, well-located lot, close to the amenities people find desirable, pay in proportion to the value of their location, not to what they paid for their property, be it last year, 5, 10, 20, 30 years ago. Those who own an off-on-the-edge postage stamp pay little or nothing (whether they've put a cottage or castle on that little lot.). I understand that you're trying to solve a local problem, but the underlying mess created by Prop 13 needs to be corrected. Taxing sales drives sales out of town. That burdens hardworking people who own and work in the shops that sell taxed goods in your community. (It probably won't hurt the landlords much.) Wage taxes are no better. Building taxes ditto. We shouldn't use them! Your town needs to make it clear to your state that Proposition 13 forces you to do stupid things. Jon Coupal and his fellow Prop 13 supporters are not working to make California better for ordinary people. They have something else in mind. There are a thousand hacking at the leaves. Go to the root of the problem and eradicate it. Prop 13 is the root of this one (and many others). It has forced California's towns into dishonest assessments and put a low cap on what is arguably the wisest, most just tax ever proposed (land value taxation). It was a California newspaperman, Henry George, who saw most clearly and wrote most eloquently on this topic. Look for his 1879 book, "Progress and Poverty," written in San Francisco. You can find a modern abridgment online at http://www.progressandpoverty.org/ and more about him and his ideas at http://henrygeorge.org/ or the URL's below. (For example, the board game Monopoly is based on The Landlord's Game, which someone developed circa 1902 to teach the wisdom of George's ideas. It came with 2 sets of rules, one similar to the game we play today, and another called the "prosperity rules." Dull game, but sustainable society!) Prop 13 is the antithesis of what George's analysis showed was the way to a good life for ordinary people. The Public, May 12, 1906, page 143.
invented by Miss Lizzie Magie of Washington, D. C, will be manufactured and ready for the market about June 1st. The Landlord's Game is played on a board about 18 inches square, divided into 46 spaces representing all the various institutions of modern commercial life. The names of some of these spaces are "Soakum Lighting System," "Slambang Trolley," "Gee Whiz Railroad," "Lord Blueblood's Estate," "Wayback," "Boomtown." "Easy Street." "Broadway," "Timberlands.'' "Oil Fields," "Jail," "Poor House," etc. The play on the board is started by the throw of dice which indicates the moves of the players and from that time on the transactions between individuals, corporations and the government are entered into with vim and interest. At the start the players are equally equipped but as the moves continue the majority of the players are apt to be forced into poverty, some even arriving at the Poor House, while one player generally becomes the millionaire. This condition prevails until the adoption of the single tax on land values, when the land rents, instead of being appropriated by individual players, are turned into the public treasury and used for public improvements. The game as then continued equalizes opportunities and raises wages, while it is impossible for one player to get any great advantage over the others. The game brings out with great clearness the exact position in the commercial world of money, transportation and land monopoly. Unlike most games that have sought to teach a problem, this game preserves all the principal features of the popular chance and skill games, at the same time demonstrating the problem with clearness and simplicity. It is easily learned and is played with great enthusiasm by children as well as adults. The Landlord's Game Is something with which all single taxers should be familiar, as It will not only afford them much amusement, but will enable them to make practical illustrations of disputed points. It gives opportunity in this direction that can be secured in no other way. The "cat" is so clearly revealed that even he who runs may perceive. The Landlord's Game illustrates the salient points of the single tax philosophy and is also interesting as a game. A thorough understanding of the principles of the Landlord's Game is equal to a whole course in political economy. The game is instructive and at the same time absorbingly interesting. The game will be furnished in a neat box with lithographed board in colors, will include a pack of cards representing title deeds, railroad charters, etc., besides checkers, dice, money and all other implements necessary to the playing of the game, and will be sent to any address in the United States on receipt of one dollar. Postage 20 cents extra. Address MISS LIZZIE J. MAGIE, Secretary, ECONOMIC GAME COMPANY. 58 WEST 68th ST., NEW YORK, N. Y.
LVTfan here: the ad has no graphics. But this game is the inspiration for the board game we know as Monopoly. Georgists argued that a system of land taxation could be introduced gradually, following informed public debate on the issues involved. To that end, during the early decades of the twentieth century they devised a series of hand-made games designed to portray the evils of the selfish system of monopoly land holding, with a view to introducing socially responsible reforms of land holding based upon the Georgist Single Land Tax proposals. The games, which circulated throughout the USA and UK, often under the title The Landlord’s Game, were played in three phases. Phase 1, based upon the existing laws of land ownership, finance and taxation, demonstrates the effects of unchecked greed and self-interest in patterns of monopoly capitalism. In Phases 2 and 3 the rules are altered to eliminate the ability of powerful players to benefit from their greed. The creators of the game held a profound faith in the human capacity for action based upon reasoned argument. The games were designed to be played co-operatively, providing a focus for discussion which took place at each of the three phases of the game. Monopoly was later developed from Phase 1, where powerful, self-interested individuals reign supreme. The later two phases, which each form games in themselves, demonstrate the potential for communities to regain ecologically and socially viable forms of access to land. Brer Fox an’ Brer Rabbit is an early version of The Landlord’s Game which circulated in the UK. After some years of research we managed to bring together a copy of the original board with a matching set of rules. Despite the title, this is not a children’s game. However, we have found that a major obstacle to the successful use of this original version of the game as a teaching aid, is the almost universal pernicious influence of the selfish, zero-sum game of Monopoly. Phase 1 does not run as smoothly as the polished version of the commercial version, and it can be difficult to shift to the different mindset envisaged in Phases 2 and 3. The thoughtful playing of Phases 2 and 3 of the Landlord’s Game raises some veryinteresting questions, such as the relationship between the ‘real’ and the ‘financial’ values of land, traditional patterns of common management of land, and the whole question of landless waged-labour. What emerges most forcefully, however, is the role of the Banker, the mysterious figure whose presence is not explained in the Georgist literature, but who is able to pay out ‘wages’ to the players to enable them to continue to participate in the game. This brings into focus the whole question of the wage/salary-slavery system that is corporate capitalism in the world economy of the twenty-first century. To play a version of The Landlord’s Game it is necessary to step back in time, to forget the rush, bustle and constant worry of the twenty-first century and take time to imagine one is alive in the idyllic years before the First World War. Although the commercially designed Monopoly can be played out in a single playing session, several leisurely sessions need to be set aside for playing The Landlord’s Game. The specific uses of the sites laid out on the board would have been familiar to the players, and would have given rise to discussion of local examples. Thus the game offers a refreshing opportunity to reflect on the purposes of the various ‘money making’ institutions on the board, including the actual money-maker, the bank itself. Devised over a hundred years ago as a DIY exercise, boards, cards and playing pieces were normally assembled from household materials. Playing tokens were buttons, badges, charms, or anything to hand. Brer Fox an’ Brer Rabbit, produced and patented by the Newbie Games Company of Dumfries, Scotland, in 1913, has been reproduced in the attached format* so that all three phases of the game can be played. The family resemblance to Monopoly is immediately obvious. Bearing in mind the history of Monopoly just described, the leisurely playing of all three phases is an excellent consciousness-raising exercise. The later two phases, which form games in themselves, demonstrate the potential for communities to regain access to land by regaining control over all forms of economic activity, including banking. Personally, I tend to agree with Karl Marx, that “in point of theory, the man [Henry George] is a back number”. The notion that an individual should have the right to buy a piece of land simply by right of landing on it when it is free, is original to the game. Equally, the Georgist game does not raise the question of money creation, the role of finance and banking in the economy or the whole question of wage-slavery upon which the edifice of global corporate capitalism rests. But that does not prevent twenty-first century players from using the sites and situations of Brer Fox an’ Brer Rabbit to review accepted assumptions about the institutions of society which govern access to wealth, property, income and power. The game offers at least as much of interest to present-day campaigners for peace, social justice, monetary reform and political sanity as it did a century ago. We look forward to opening a dialogue with groups who have played the games successfully. Then go here: http://www.douglassocialcredit.com/resources/social-art/monopoly to print out the rules, board, cards, and money to play this game yourself. The Writer's Almanac with Garrison Keillor. It was on this day in 1935 that a woman named Elizabeth "Lizzie" Magie Phillips agreed to sell Parker Brothers the patent for her version of the board game Monopoly. Lizzie Magie had invented the game back in 1903, although she called it The Landlord's Game, and in 1904 she was issued a patent. It was a game intended to teach a strong moral lesson. Magie was a young Quaker woman and a follower of Henry George, a political economist. George was the author of Progress and Poverty (1879), which was a huge best-seller, selling more than 3 million copies, a big number for its day. He argued that poverty was a direct result of monopolies placed on land and resources, and that it was immoral for a few people to own natural resources — especially land — and then rent them out. Not only was it unethical, he said, but it also would hurt the American economy. His solution was called the "single tax" theory — he thought that everyone should have an equal share in the land where they lived or worked, and pay a single, equal tax on it. 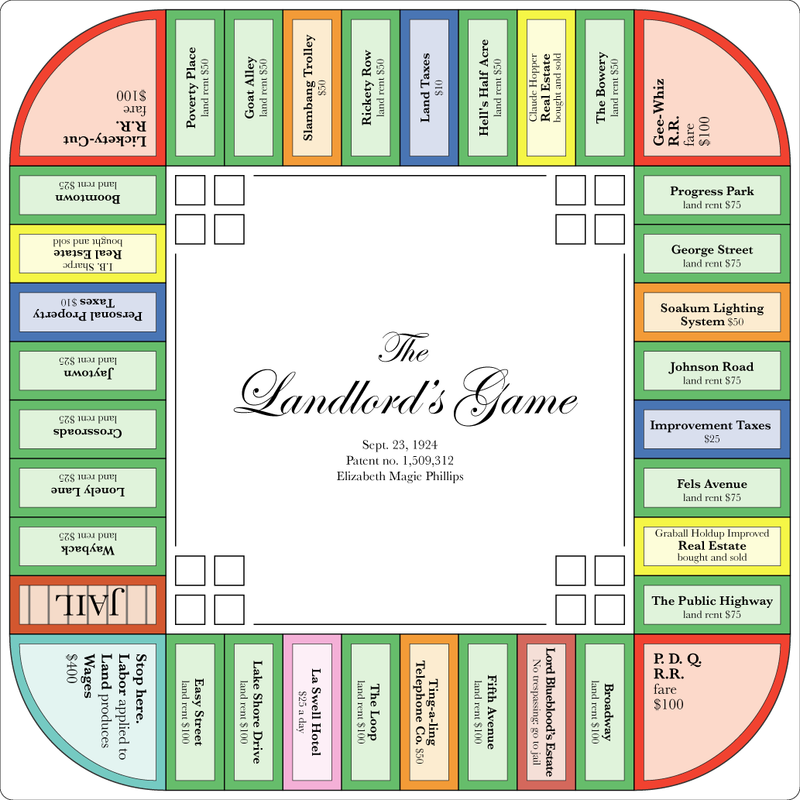 So Lizzie Magie invented a board game that showed how the evils of the current economic system — how landlords could become wealthy by buying a piece of land and then charging rent. The board looked very similar to the modern Monopoly board, with railroads in the corners, properties along the sides, some stops to pay property tax or improvement taxes, public utilities, and a jail square. She explained that the point of The Landlord's Game was "not only to afford amusement to the players, but to illustrate to them how under the present or prevailing system of land tenure, the landlord has an advantage over other enterprises and how the single tax would discourage land speculation." The Landlord's Game became extremely popular in the homes of Quakers and other similar-minded people, and it was promoted by a professor of economics at the University of Pennsylvania named Scott Nearing — he was eventually fired for his radical politics and became an icon of the back-to-the-land movement as the co-author, with his wife, Helen, of Living the Good Life (1954). But for years he used The Landlord's Game to teach students about the inequality of capitalism, and it was that group of students that nicknamed the game Monopoly. Many of them, in turn, took it to their own classrooms, redrawing the boards from memory. And so the game continued to spread, with rules and boards changing as people re-drew it, often modeled after the town of wherever it was being played. A woman named Ruth Hoskins took it to Atlantic City to use in the Quaker Friends School there, and it took on Atlantic City names and was picked up by an out-of-work electrician named Charles Darrow. Darrow was one of many people who tried to publish their own version of the game, but it was his that Parker Brothers chose in 1935, when they realized that the game was so popular anyway, they might as well be making money on it. By this time, it had lost almost all of its original social message. Charles Darrow claimed he had made the game up out of his head, inspired by a book he had read about a school where they taught business with fake money. The only problem for Parker Brothers was that Lizzie Magie, now Lizzie Magie Phillips, still owned the patent to The Landlord's Game,which was so similar to the version they bought from Charles Darrow that they needed to buy up her patent as well. She refused to let them make changes to her original game, because she didn't want Henry George's ideas to disappear. But she didn't think to demand that they wouldn't publish the new version of Monopoly they had purchased from Charles Darrow. So they told her that they would keep publishing a version of her game and bought her out for $500 on this day in 1935. From then on, they promoted the Atlantic City version of Monopoly and published the story of a brilliant unemployed electrician who came up with the idea out of the blue. It wasn't until the 1980s, during a court case about a board game called Anti-Monopoly, designed by a college professor, that the true history of Monopoly's origins came out. In 1936 alone, the year after Parker Brothers secured the patent, 1,810,000 copies of Monopoly were sold. Today it is the most-played commercial board game in the world. An Irishman's Diary - The Irish Times - Sat, Nov 06, 2010. SEVENTY-FIVE years ago today, an American woman called Lizzie Magie sold the rights of a board-game she had invented to Parker Brothers, the then dominant players in the market. Her game was, in effect, Monopoly, as which Parker had already bought it from Charles Darrow, an electrician who lost his job in the Crash of 1929. Darrow’s version was a big seller. But the company knew it was merely a variation on Magie’s original. Ownership of the latter was therefore vital to their hopes of a patent. A potential obstacle, however, was that Magie was not motivated by mere money. Then aged 70 and described in one US account as “a little old gray-haired Quaker woman”, she was more interested in the educational properties of her creation, which she had designed more than 30 years earlier to propagate the theories of a political economist named Henry George. George’s big idea was the injustice of private land ownership, which he believed impoverished the many while enriching the few. He wanted all land nationalised and then redistributed in equal parts, with a single tax on all occupiers. It had been in support of this, and to demonstrate the evils of private monopolies, that Magie created the “Landlord’s Game”, as she called it. Which, as Parker Brothers knew, had been played widely – especially in Quaker circles – for three decades before Darrow’s version appeared. In a legal deposition many years later, the president of Parker recalled his impressions of Magie as “a rabid Henry George single tax advocate, a real evangelist; and these people never change”. So having made his cynical diagnosis, he gave her what she wanted: $500, with no royalties, and a promise that her game would be promoted in its original form, spreading George’s gospel, alongside the Monopoly version. Well, the writer doesn't quite have all his facts right -- Henry George did not seek to nationalize land or redistribute it in equal parts, just to collect the lion's share of the rental value of the land and use it for public purposes. And I've heard it said that though the game was widely played in Quaker circles, Lizzie Magie was not herself a Quaker. Frank McNally might also have chosen to mention that another of Henry George's books, originally titled "The Irish Land Question," was later republished as simply "The Land Question" because what was seen in Ireland was actually occurring nearly everywhere, but was more visible in Ireland. The book remains in print today, including a new edition available from schalkenbach.org and Amazon. I heard something this morning on the radio which tickled my funny bone, and then got me thinking. The program was "Wait, Wait -- Don't Tell Me" and they were spinning yarns for a contestant to pick out the real one from the two made-up news stories. The theme was about how the wealthy are different, and there was a tale of rich people, perhaps in some form of noblesse oblige, choosing to play the board games Life and Monopoly with $1,000 less in starting money than the rules call for. Look at what happens in the board game Monopoly. Everyone starts with the same amount of money, and each one earns the same salary ($200 for each pass around the board). And yet some become wealthy and most end up penniless. The rules and structures are designed to create that situation. Some of it is random, or at least appears to be: what happens to you depends in part on a throw of the dice. Assuming all the players are using the same dice, one assumes that much is due to "chance." There is even a deck of cards by that name, each of which produces a different turn outcome. Imagine Monopoly if the rules were a little different: that some started the game with a bit more money, or an undeveloped property they already owned, or a block or neighborhood with single family houses on them. After all, we weren't all born the same year. Or imagine that instead of all players receiving $200 each "year," some of us received $400 or $600, and others received only $80 or $150. Or combine those two assumptions. Or imagine that the amount each player receives begins at $80, and for some rises and for others does not. Or assume that some of us receive nothing, since there is a finite amount of money in the game, and if the powerful players have it all tucked under their side of the board, it simply isn't available when you pass "GO." Those who have explored this blog may know that the board game Monopoly was not created during the 1930s depression, but is a direct descendant of a turn-of-the-century board game called The Landlord's Game, which was created to teach the ideas of Henry George. Elizabeth Magie (later Phillips) patented it in 1904, and later versions in the 1920s. (See a modern rendering here.) I've also seen pictures of another board for the Landlord's Game, showing a community surrounding a lake; one advances around the board. The game came with two sets of rules, one called the Landlord Rules, rather similar to the game we know today. The other set was called the Prosperity Rules. You might enjoy the recent article in Land & Liberty (pages 14 & 15). Don't miss the last couple of paragraphs. "Goal" is actually "Gaol" -- what we know as Jail. The "Prosperity" rules were not similar to the rules of the Monopoly game as we know it. Rather, they were similar to the original rules, which produced a VERY dull game. No big winners, no losers. Just a sustainable situation in which all could prosper. Not much fun on a Sunday afternoon, but a good model for real life. The OTHER rules are similar to the Monopoly game we know today. This website is missing the richest part of the story! I'll post more on the subject over time.